This game can be played with one group for adventure and as an "ice breaker", or competitively with two or more groups as a challenge. Each group is given a crossword puzzle and a map. The object of the game is to complete the crossword puzzle and related activities in the shortest amount of time while also maintaining accuracy. 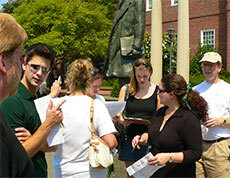 The puzzle words relate to the Annapolis Historic District and as much about your company/group as you care to include. Each team must navigate and search Annapolis for the answers. Clues are often directions of where the team can go to learn or obtain an answer. Other answers will be revealed by the team's colonial guide. 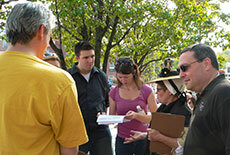 A colonial guide is sent with each group to convey information about Annapolis and colonial life that do not have physical clues to be found. 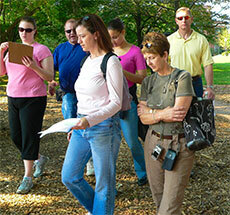 The guide will notify his team when they have arrived at a "hot spot". At each "hot spot" the guide will give his team a short talk revealing at least one answer -- or maybe two. Each group must stay together while solving the puzzle. If a group member needs to drop out, stay behind, or has a special need; they would simply notify their guide. 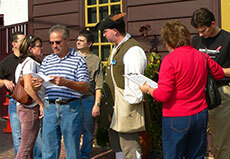 Additionally, guides will answer any questions about Annapolis in general unrelated to puzzle answers and banter about colonial times in Annapolis. If played competitively, a winning team is determined by a final score. Points can be both earned and lost while playing! 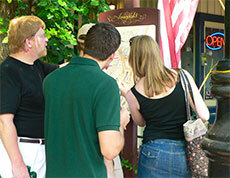 Group size can range from 2 to 10; however, we recommend 5 to 8 per group for optimal enjoyment and personal involvement. Please schedule 2 hours for the event. If you don't have 2 hours, we can arrange a "lite" version of the game. The distance walked varies, but usually is about a mile. Good walking shoes are recommended. Call to discuss pricing and any particular needs or desires your group(s) may have. We can tailor the adventure to meet your requirements. We can add words that relate to your business/group (just to keep everyone on their toes). For more details, call us at 410-248-6726.